The Panasonic computers from the JD Series are classic CP/M professional systems released at the begining of the 80's. They are powered by an Intel 8085A processor, offer from 32 KB to 64 KB RAM and are equiped with two 8" or 5.25" floppy disk drives, depending on models. No graphic features here, but 80x24 text resolution on a 12" built-in green phosphor monitor. The following software were delivered on disk: CP/M 2.2, Microsoft Basic, MicroCobol and Assembler. 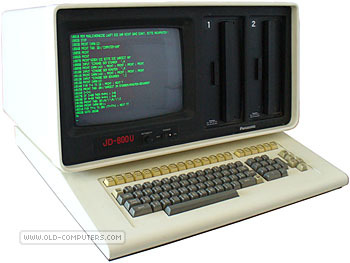 Panasonic released several computers in this serie: JD-800U, JD-840U, JD-700U, JD-740U, JD-850M, JD-800M and JD-740M. There were almost the same systems with RAM and/or floppy fisk drive specs differences. See the comparison charts for more details. see more Panasonic JD series Ebay auctions !